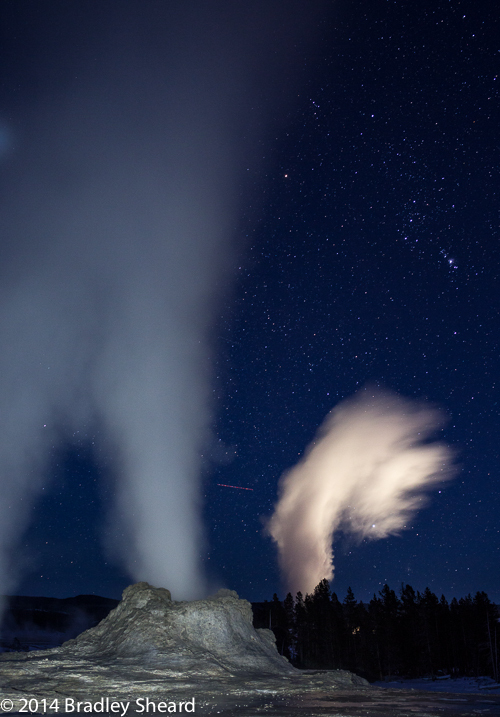 Castle and Old Faithful geysers beneath the constellation Orion (2014). 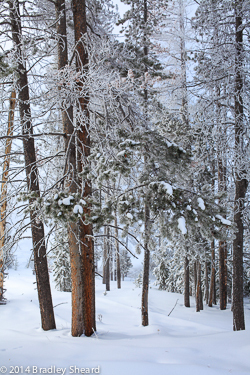 Winter in Yellowstone National Park is both harsh and beautiful. 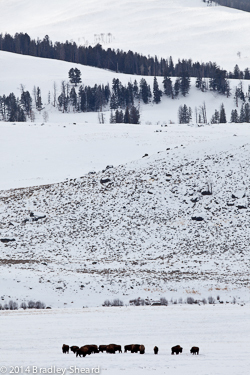 After watching a number of television specials and visiting during the fall elk rut, I wanted to go try my hand at photography in this desolate place during the winter. Planning such a trip can be a bit intimidating though--the temperatures reportedly can reach -40F. While I never saw temperatures that low (generally they were in the range of 0 to 20F, although it was -20F one morning), I found that as long as you dress properly and are prepared for any contingencies, it isn't really that bad. I considered joining a commercially run photo workshop since the conditions seemed so harsh, but in the end just went by myself and 'winged-it,' which worked out fine. It ended up being a fantastic adventure, so good that I came back again! The photographs here were collected on two trips, in January 2012 and again in January 2014. I split my time on both trips between Old Faithful (only accesible via snowcoach, and staying at the Old Faithful Snow Lodge), and the Northern part of the park, staying in Gardiner Montana. Most of the roads in the park are closed to normal vehicle traffic during the winter, but groomed for snowcoach and snowmobile traffic. The only roads open to automobiles during the winter are the roads from the North entrance in Gardiner Montana, to Mammomoth Hot Springs, then on to the Northeast entrance near Cooke City Montana. 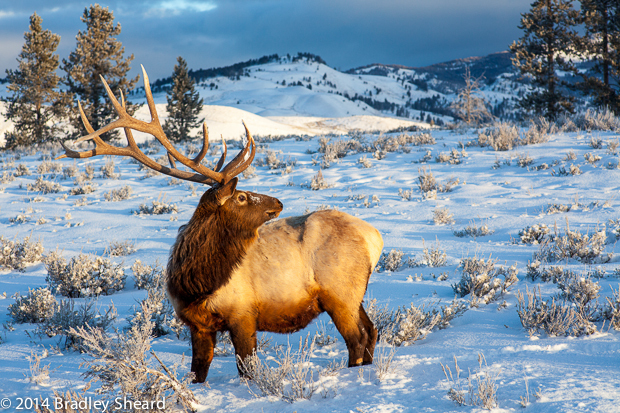 Fortunately for photographers interested in wildlife photography, this road passes through the fabulous Lamar Valley. The road is only plowed and maintained during daylight hours, however, and is often icy and snow covered, with snow tires recommended and sometimes required. Your best bet for navigating these roads is to rent an all wheel drive Subaru from Phasmid Rentals in Bozeman Montana. Their cars are equipped with snow tires and handle the snowy conditions with ease. Will Casella at Phasmid is fantanstically helpful and a pleasure to deal with. (One word of warning: Beware the soft snow shoulders else you get stuck!) Phasmid can also help you plan your trip, and rents other outdoor gear as well. The photographic opportunities were greatly varied. Any search for wildlife has its ups and downs--some days it seems slow and deserted, but then suddenly you see something amazing and its all worth it! Persistence seems to be the key, and I like to constantly keep moving, covering as much ground as possible in order to maximize my chances of encountering wildlife. Weather is always a factor, of course, with snow falling many days, but then it clears and the sun appears. 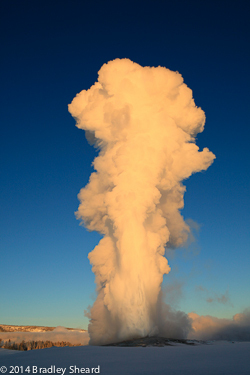 Morning light seems to last a long time with the sun low on the horizon, and the quality of light on those cold, clear mornings in the geyser basin can be spectacular. All of these images were taken with Canon cameras: 1DmkIV, 5DmkII and 5DmkIII. Lenses used were Canon 500mm f/4, 300mm f/2.8, as well as Zeiss 35mm f/1.4 and 85mm f/1.4. Images were processed in Adobe Lightroom.